The tandem of Filipino Treat Huey and Belarusian Max Mirnyi will be one of the seeded pairs when the prestigious Australian Open doubles competitions begin on January 16 at the Melbourne Park in Australia. Huey and Mirnyi are ranked 10th in the acceptance list released by the Association of Tennis Professionals (ATP) World Tour on Tuesday. Mirnyi is at No. 21 in the doubles world ranking while Huey holds the 22nd spot. Leading the pack are top seeds and 2015 finalists Pierre-Hugues Herbert and Nicolas Mahut of France, defending champions Jamie Murray of Great Britain and Bruno Soares of Brazil, and six-time winners Bob Bryan and Mike Bryan of the US. The other seeded pairs are Henri Kontinen of Finland and John Peers of Australia, Feliciano Lopez and Marc Lopez of Spain, Raven Klaasen of South Africa and Rajeev Ram of the US, Ivan Dodig of Croatia and Marcel Grabollers of Spain, Daniel Nestor of Canada and Edouard Roger-Vasselin of France and Lukasz Kubot of Poland and Marcelo Melo of Brazil. Last year, Huey and Mirnyi had a colorful run in Grand Slam events. They reached the quarterfinals of the Australian Open (losing to Daniel Nestor of Canada and Radek Stepanek of the Czech Republic, 4-6, 4-6) and semifinals in the Wimbledon Championship (bowing to Herbert and Mahut in five sets, 4-6, 6-3, 7-6 (3), 4-6, 4-6). Huey and Mirnyi made it to the third round of the French Open and first round of the US Open. Huey and Slovenian partner Andeja Klepac were also semifinalists in the Australian Open mixed doubles. Huey’s dream of booking a first finals stint in a Grand Slam event was foiled when he and Klepac succumbed to Tecau and American Coco Vandeweghe. 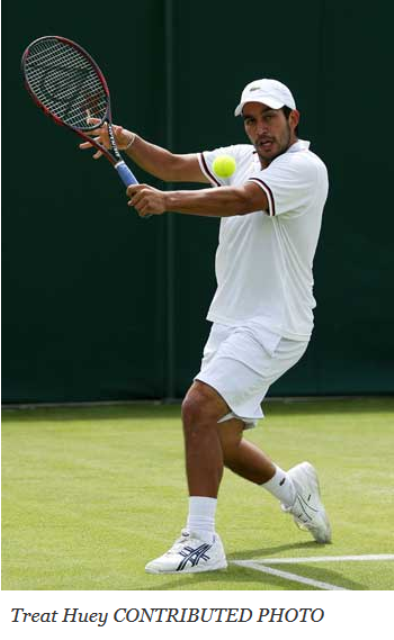 Before flying to Melbourne, Huey had a warmup tournament in New Zealand where he competed in the singles qualifying stage but lost to Canadian Steven Diez, 5-7, 2-6.